Jobs that let you make money online from home are not all created equal but they are pretty flexible. Some work from home jobs are telecommuting positions provided by an employer while others require you to be an independent contractor, find your own clients and create your own schedule. Some positions involve freelancing and some are smaller, micro jobs while others are just flat out scams. 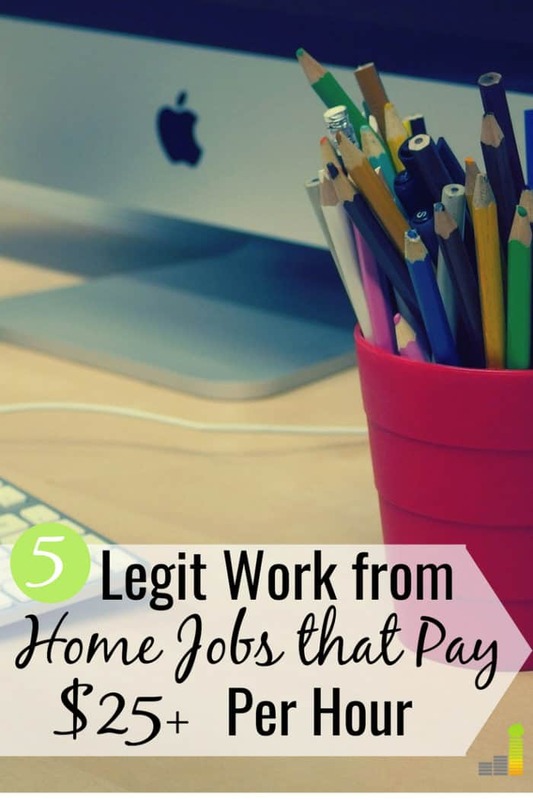 When it comes to finding the best work from home job, you want to make sure it’s legitimate and worth your time. 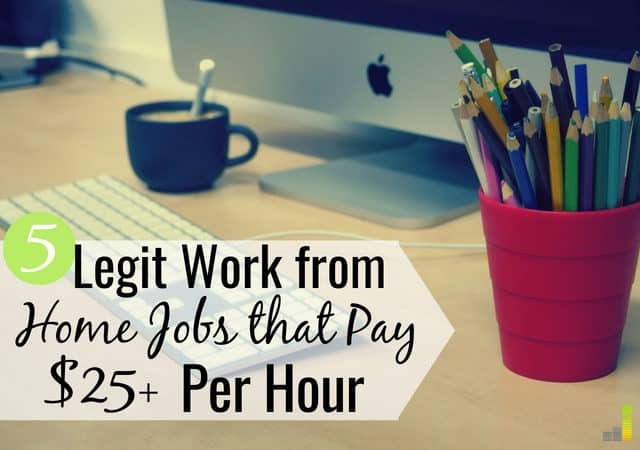 Taking surveys and doing micro jobs on sites like Fiverr may be quick ways to earn extra money, but if you are trying to earn more or supplement your income by a large amount, you may want to consider some of these proven high-paying work from home jobs. Virtual assistant work is growing in need and popularity every year. Virtual assistants do everything from digital administration tasks like sending out invoices, reading and responding to emails and managing websites behind-the-scenes, to scheduling meetings and social media updates, editing content, creating graphics and more. To be a good virtual assistant, you have to either have a lot of computer and digital marketing skills or you need to be a quick study at these things. If you are easy to train and can pick up certain things quickly, you’ll really help make clients’ lives easier and allow their businesses to run smoother. Virtual assistants can make anywhere from $10 per hour starting out to $30 per hour or more if experienced. Plus, there is always more work since this type of job is in demand. My friend Kayla is a virtual assistant who earns over $10,000 per month. If you want to start your own freelance virtual assistant business and make thousands per month, sign up for her course to learn how. Graphic designers can easily earn a full-time income whether they are working in an office or from home. According to the Bureau of Labor Statistics, graphic designers earn $23.41 an hour on average. Graphic designers in the top 10 percent earn more than $77,370 annually. If you know how to create graphics or want to try your hand at designing websites, just 1-3 clients per month can easily cover all your basic expenses. You can sell designs through CafePress for anything from T-shirts to mugs and more. It also wouldn’t be a bad idea to invest in your education so you can learn more about design and how to use helpful tools like Photoshop. Designing logos on Fiverr would help you earn extra money, but by expanding your skills, you can make graphic design a career and work from wherever there’s an Internet connection. If you can type very fast and accurately, your skills can pay off if you’re looking for a flexible work from home job that pays well. Transcriptionists type out audio conversations, including video recordings and podcast or radio interviews so others can read them. 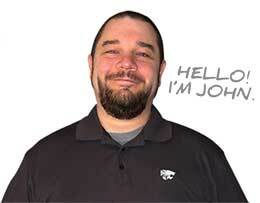 When it comes to transcription jobs, proficiency is key. To get jobs, you often have to take a test to prove your skills. You can either become a freelance transcriptionist or work under a company. Proofread Anywhere provides free courses to help you learn how to land general proofreading and transcript proofreading jobs with no writing required. You can earn anywhere from $24 – $39 per audio hour proofreading and the best part is you can literally do it from anywhere. If you’ve always wanted to teach but didn’t know if you’d be able to support yourself with the job seeing as how many teachers earn a lower salary, consider becoming an online ESL instructor. You can teach through sites like Qkids and make up to $20 per hour. What you need is to be fluent in English, have a desire to teach, and a college education, along with basic computer skills. My sister has been an online ESL teacher for over a year now and she loves it. She gets to work with students from other countries and cultures on a flexible schedule and avoid commuting back and forth like traditional teachers do. SayABC is another great option to teach students overseas, using an experiential based teaching approach. SayABC pays up to $28 per 40 minute session. A few weeks ago, my husband got very sick with flu-like symptoms. Since we were almost certain he had the flu, my husband was hesitant to visit a doctor because there’s really nothing you can do to cure the flu other than to rest and drink lots of fluids. Medicines can soothe the symptoms but that’s about it. Instead, he realized that our insurance allowed him to speak with a nurse on the phone about his condition and she advised him to do a few things without even having to leave the house. 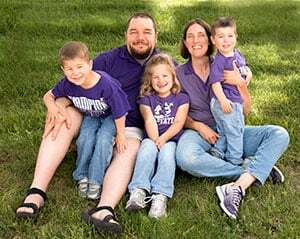 That experience inspired me to learn more about telephone nursing jobs and I found out that they are a profitable way to put your nursing degree to good use and earn just about or even more than what a registered nurse earns who works in a hospital or doctor’s office. According to SalaryExpert, telephone nurses assess patient health problems and needs, develop and implement nursing care plans, and maintain medical records. They earn an average of $36 per hour and the entry-level salary is $58,462 compared to the senior-level salary which is $90,950. If you’re looking to work remotely as a telephone triage nurse, you can search through a variety of openings on an online job board like Monster. It’s important to keep in mind that many telephone nurses work on site but there are remote opportunities available as well. If you are hired for a position, you may be required to work on-site and train for the first 90 days, then you’ll be able to do your job from home. I’d be remiss if I didn’t mention blogging as another possibility to work from home and make a nice income. Blogging is great because it allows you the opportunity to make a decent income as well as a portfolio to get clients if you write or are a designer. You can make money blogging from affiliate advertising, sponsored campaigns, display advertising and many other avenues. It is important to keep in mind that just like any other job, blogging takes work and time. If you’re willing to put the effort in and have a voice, you can make good money blogging. I know it may seem impossible to make money blogging if you don’t have the technical know-how. Thankfully, that’s not the case. If you’re interested in starting a blog of your own you can set it up with a few simple clicks through Bluehost. Bluehost will set up your blog and get you started for $2.95 per month, with a few simple clicks. I’ve been able to replace the income from my day job through blogging. So, it’s definitely possible to earn an income from a blog – just remember it takes time. You can make money blogging in a variety of ways from affiliate marketing to display advertising and much more. If running a blog doesn’t seem like something you want to do, you can still work online from home and make a good salary – through flipping retail products. Do you have an eye for a good deal? You can sell those items, for a profit, by using Amazon FBA. You can make hundreds, or more, each month by selling items through Amazon. Here are some free training courses to help get you started to make money on Amazon. There are many opportunities out there, you just need to know where to look. As I stated earlier, all online jobs are different and pay differently. The biggest misconception I hear is that you can earn good money online doing anything. Just like traditional jobs, you need to have certain skills and experience to market yourself for higher paying positions. If you’re just starting out, finding gigs through Fiverr can be a great way to get some experience and possibly build a small client base since you can find work in many areas. While telecommuting jobs are becoming more popular, some employers and clients are still skeptical about how productive freelancers and work from home employees will be. This doesn’t mean that it’s extremely hard to earn a full-time income from home. You just need to start by identifying jobs that interest you and align with your skill set. If you need extra training or experience, be willing to invest in it if it’s going to increase your earning potential in the long run. Do you do any work online? Did any of these high-earning work from home jobs surprise you? Why do you think so many glamorize working from home? Online English teacher sounds interesting…do they require some type of certification to do this? In some cases yes but in others, they just like to see either experience or some college education which demonstrates that you’re trainable. I mentioned a few website leads to check out in the paragraph and they’re requirements for online instructors varies. Great options Chonce! I like that there are a variety of full-time and part-time jobs for working from home. My father-in-law created the app that people use to take orders for My Pillow. It’s a great way to make some extra money from home as you can essentially sign on whenever you want. I’m a virtual assistant and it’s a great gig! I can set my own hours and can pretty much work from anywhere there is an internet connection. But it is also a tough gig at times. Just like any other business, building a solid roster of clients is a lot of work. You have to be a self-starter and highly motivated to make a sustainable living at it. Hello Chonce, thank you for all the above information, I found it very helpful. I would like to ask one question, I saw that all the earnings are in dollars so does that mean the work is only in America or could the work also be for me in South Africa. Not a problem Pam. Unfortunately, it depends on the company you’d be working for. Some will work with individuals outside the States, but it varies from company to company.